The leopard strayed into Savarkar Nagar area in the early hours of the day and was finally caught by Forest department personnel at around 10:45 am, an official from Gangapur Road police station said. The media personnel were trying to obtain video footage of the animal when it pounced on them. A leopard Friday entered a crowded locality in Maharashtra's Nashik district and was caught several hours later but not before it had injured a local politician and two media personnel, the police said. 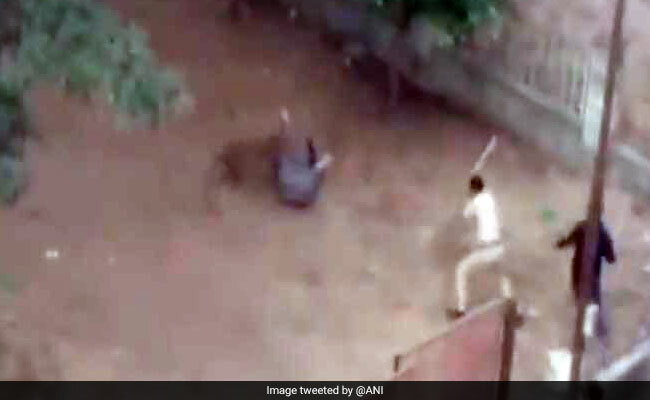 "Local Shiv Sena corporator Santosh Gaikwad, television news channel cameramen Tabrez Shaikh and Kapil Bhaskar were injured by the leopard. They are undergoing treatment at a nearby hospital," he said. While Mr Gaikwad was trying to control the large number of people who had assembled to see the rescue efforts, the media personnel were trying to obtain video footage of the animal when it pounced on them, he added. The western part of Nashik district has dense forests which are home to leopards, wolves, hyenas and foxes etc, an official said.